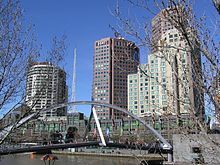 Southbank is an inner urban neighbourhood of Melbourne, Victoria, Australia, 1 km south of the Melbourne central business district. 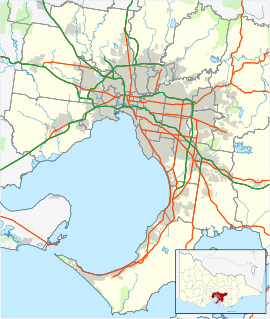 Its local government area are the cities of Melbourne and Port Phillip. At the 2016 Census, Southbank had a population of 18,709. Its southernmost area is considered part of the central business district of the city. Southbank is bordered to the north by the Yarra River, and to the east by St Kilda Road. Southbank's southern and western borders are bounded by Dorcas Street, Kings Way, the West Gate Freeway and Montague Street. Southbank was formerly an industrial area and part of South Melbourne. It was transformed into a densely populated district of high rise apartment and office buildings beginning in the early 1990s, as part of an urban renewal program. With the exceptions of the cultural precinct along St Kilda Road, few buildings built before this time were spared by redevelopment. Today, Southbank is dominated by high-rise development. It is one of the primary business centres in Greater Melbourne, being the headquarters of Treasury Wine Estates, Crown Limited, Alumina, Incitec Pivot, The Herald & Weekly Times (including the Herald Sun), as well as regional offices of many major corporations, in a cluster of towers with over 340,000 square metres of office space in 2008. 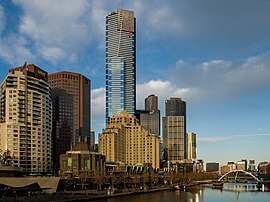 It is also one of the most densely populated areas of Melbourne, with a large cluster of apartment towers, including Australia's tallest tower measured to its highest floor, the Eureka Tower. Southbank Promenade and Southgate Restaurant and Shopping Precinct, on the southern bank of the Yarra River, extending to Crown Casino, is one of Melbourne's major entertainment precincts. 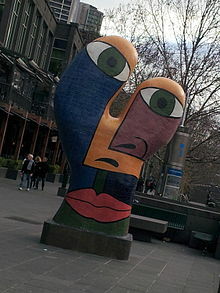 Southgate's landmark Ophelia sculpture by Deborah Halpern has been used to represent Melbourne in tourism campaigns. Before European settlement, the area now called South Melbourne was a series of low lying swamps inhabited by Aboriginal tribes. From European settlement the area which is now Southbank consisted of some old factories, warehouses and wharves, mostly built between the 1860s–1920s when the area was part of the first port of Melbourne. It had several bridges connecting it to the city, the first being the original Princes Bridge and later the Sandridge Bridge, which was formerly part of the Port Melbourne railway line from 1888 to 1987. The Arts Centre precinct opened in the 1980s on former parkland, which was once used as an amusement park and featured the Southgate Fountain. The area was the subject of urban renewal in the 1980s and early 1990s. In part, this was aimed at stimulating development in a period when Melbourne was experiencing an acute economic downturn during the global recession on 1991–92. Denton Corker Marshall designed and oversaw the original Southbank Promenade in 1990, which paved the way for development of apartments. Southgate, Sheraton Towers and new tall office buildings for The Herald & Weekly Times Ltd and IBM were built along with an award-winning pedestrian footbridge at about the same time in late 1992, and combined with a new Sunday arts and crafts market, attracted locals and tourists to the area. At the eastern end of the area is the Victorian Arts Centre. Since then, the pylon underneath the award-winning Southbank Pedestrian Bridge has been utilised and is now home to Ponyfish Island. Further buildings including the Esso headquarters were built between 1992 and 1995. Development expanded along the Yarra River westward, with the Melbourne Convention & Exhibition Centre in 1996 and Crown Casino in 1997, stimulating the first residential towers. In 2001, the boutique "Melburnian" apartments, designed by Bates Smart, were one of the first to be aimed at the owner occupier market and included the most expensive penthouse sold in Melbourne at the time. Clarendon Towers also attracted the owner occupiers. Beginning with Southbank Towers in 1997, Central Equity began a swathe of apartment towers. In 2002 the neighbouring Yarra's Edge precinct of the new Melbourne Docklands began to kick off. The arts precinct was extended with the construction of the award-winning buildings for the Australian Centre for Contemporary Art in 2002 and the Victorian College of the Arts school of drama. At around the same time a new headquarters for the State Emergency Service was built. Central Equity continued construction of several blocks of apartment buildings on much of the Southbank land, which it had acquired including Riverside Place, The Summit, Sentinel, Victoria Tower, Melbourne Tower and City Tower. Central Equity apartments are aimed at both the owner occupier and rental market with management provided by Melbourne Inner City Management (MICM), a fully owned subsidiary of Central Equity. With a boom in apartment building and the success of the Melburnian, the areas closer to the river began to attract developers. The 91 floor Eureka Tower was begun in 2002, aimed at being the tallest residential tower in the world and was completed in 2006. As part of the initial construction of Southgate, St Johns Lutheran Church relocated from the land that is now the site of the Herald Sun building a few metres up City Road, to 20 City Road, and serves the Southbank community as a church and spiritual centre. The Church can be accessed either from City Rd or from the Southgate Shopping complex. The Queensbridge Precinct began development in 2005 with Freshwater Place. A plaza linked to the north bank and Flinders Street railway station via a pedestrian and cycle path developed from the Sandridge Bridge. The formerly disused bridge was opened to the public on 12 March 2006, just in time for the 2006 Commonwealth Games. The Northbank promenade was completed later in 2006 to link the sections. An increasing number of corporations began opening their offices in Southbank. PricewaterhouseCoopers relocated their office from Spring Street to Freshwater Place in 2005. Other names on the list include Fujitsu, and Foster's Group. In May 2008 the Victorian Government created the new suburb place and name ‘South Wharf’, in the western end of Southbank (now encompassing the Melbourne Convention & Exhibition Centre and the Polly Woodside National Trust museum). South Wharf is home to several large apartment buildings, along with a hotel and a large shopping centre precinct. Southbank and South Wharf share the same postcode (3006). Despite being dominated by modern apartments and office towers Southbank has a number of significant heritage buildings existing in the Arts precinct, on the eastern end and along St Kilda Road, which includes the Victorian Arts Centre and National Gallery of Victoria (1960s), parts of the Victorian College of the Arts campus as well as the Victoria Barracks and Malthouse Theatre. Rare pockets of heritage on the western side includes the Jones Bond Store (25-43 Southbank Boulevarde), built in 1888. Southbank features some radio & television studios owned by the Australian Broadcasting Corporation. The studios are serviced by shows like 774 ABC Melbourne, 621 ABC Radio National, ABC Classic FM 105.9, Triple J 107.5, and television programs such as Stateline, ABC News Victoria and also with other programs such as Spicks & Specks, East of Everything, as well as entertainment, arts, documentaries and more, plus international broadcasts Radio Australia and Australia Network. The national headquarters of the Herald Sun newspaper are also located in Southbank. The suburb also has its own local newspaper the Southbank Local News, which circulates monthly. The Southbank Promenade, designed by architects Denton Corker Marshall, runs from Princes Bridge along to Queens Bridge Street and Queens Bridge, which also incorporates Queensbridge Square and continuing to the west of the Bridge is "Yarra Promenade", which runs underneath Kings Way and the King Street Bridge to Clarendon Street and the Spencer Street Bridge, including the Crown Entertainment Complex and promenade restaurants. The Southbank art and craft market occurs on the promenade near the Arts Centre every Sunday. The promenade is also home to several buskers and a pavement chalk artists. Southbank has a network of major roads running through it and is often heavily congested with traffic and limited mainly to offstreet multi-storey parking. The West Gate Freeway runs along the south border which has numerous interchanges to Southbank's roads. The main north-south arterials leading into the Melbourne City Centre are Kingsway, Clarendon Street and Queensbridge/Moray Street. Secondary internal main roads include Southbank Boulevard, Sturt Street and Power Street. The main east-west arterials are City Road (east–west) and Normanby Road (which curves south into Whiteman Street). Many smaller roads allow one-way traffic only, to limit congestion. Although Southbank promenade forms part of the Capital City Bicycle Trail, the large number of pedestrians in the area means bicycle riding at high speed is hazardous; 10 km/h speed restrictions affecting cyclists are in place, with Victoria Police enforcing the speed limit. ^ a b Australian Bureau of Statistics (27 June 2017). "Southbank (Vic) (State Suburb)". 2016 Census QuickStats. Retrieved 12 April 2018. ^ Jefferson, Andrew; Collelouri, Cesira (28 January 2015). "Southbank rumble strips to slow speeding cyclists". Herald Sun. Retrieved 13 December 2015. ^ "Police target cyclists on Southbank Promenade". News.com.au. 29 October 2007. Retrieved 13 December 2015. Wikimedia Commons has media related to Southbank, Victoria.